Over the past few weeks, we’ve been looking at the finer details of this year’s MAFS weddings and locations. The final installment on this journey takes us to three beautiful club-style weddings with a difference. Come and join as at Mike and Heidi’s nuptials at the Byron Surf Life Saving Club as well as Sam and Elizabeth’s and Melissa and Dino’s weddings at the Sydney Polo Club. One would be forgiven for thinking Mike and Heidi’s wedding ceremony took place on a remote, tropical island. 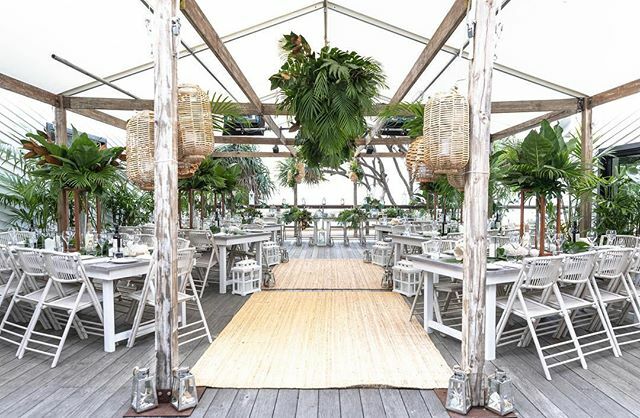 The surf was up, the breeze was gently rustling through palm leaves, whimsically arranged on an arch down the aisle, and glass bulbs in fishing nets scattered on site completed the castaway look. Clarkes beach is a popular ceremony spot in Byron Bay. Nestled between Main Beach and The Pass, it offers protection, is reasonable quiet and affords sweeping views of the bay, lighthouse, Mount Warning and Julian Rocks. The celebrations continued with a relaxed and beachy feel at the popular Byron Surf Life Saving Club. There was an abundance of green palm leaves and tropical plants, as well as lanterns scattered above and among the white cane furniture. Simple, yet elegant glassware adorned the tables, with white corals and sailor’s rope finishing the look. The highlight was the bridal table, which was beautifully framed by a view right out onto the open ocean. If you’ve always dreamt of getting married in Northern New South Wales, check out my blog for more. Sam and Elizabeth’s as well as Melissa and Dino’s weddings took place at the prestigious Sydney Polo Club. Built on the land of an old dairy farm, the venue is known as the oldest club in the Southern Hemisphere. It hosts the XI FIP World Polo Championship - we told you it was quite esteemed! Melissa and Dino’s ceremony and reception were held at Sunnybrook Barn. The venue, decoration and styling were the epitome of rustic charm. Picture wicker baskets filled with an abundance of harvest blooms and native shrubs, an aisle girt by sunflowers and straw bales, fairy lights strung up in the barn and plenty of votive candles to set the mood. Sam and Elizabeth also got married at the Sydney Polo Club. Their theme however was all about flowers, pinks and whites. The ceremony took place in a blooming orchard, where the bride and groom were framed by two half moons arches, garlanded by cherry blossoms. The reception was held in an undercover arena with flowers once again playing the key part. Picture an abundance of pink and cream roses, lavender-coloured lupines and cherry blossoms. Beautiful floor lanterns created a warm glow after sunset. To find out what else Sydney Polo Club has in store, visit their website. Club weddings offer so much flexibility when it comes to the set up and styling. There will almost always be an indoor and outdoor option for your ceremony and plenty of different seating arrangements for the type of nuptials you prefer. Another benefit is that you will often have wedding planners on site and don’t have to worry about the food. Nearly every town in Australia will have a club or two, and it’s best to enquire early, as their calendars can fill up quite quickly! If you need help planning your perfect nuptials, get in touch today and I look forward to creating something that adds to your personal love story for years to come.